Google’s Latest nexus flagship – Nexus 6 made exclusively by Motorola is an amazing smartphone including pure android edition and motorola’s magic touch. Google recently released new update to lollipop – 5.0.1 which fixed many bugs but you might be thinking How to root nexus 6 on android 5.0.1 or on the latest version. Here I am going to show you the tutorial which is very easy to follow to root your nexus 6 with the latest android lollipop. Rooting has many benefits and extends many new doors to your smartphone. For that you also need to unlock the bootloader of your nexus 6 device. I am going to show you an amazing tool to not only root your nexus device but also to unlock bootloader, flash stock rom, install custom recovery, flash custom ROM, and many more. This tool called – Nexus toolkit is developed by WugFresh and it works perfectly in almost all the nexus devices – new or old ones. Here I also embedded video which is developed by LivingAndroid so that you can understand easily. It is preferrable to create full backup of your data in case of any data loss. Read our guide to create complete android backup. Make sure your device is completely charged or atleast having 50% battery otherwise first charge your device. 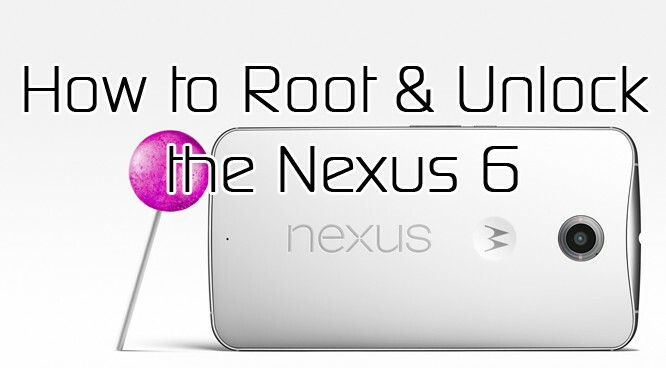 Download Nexus Root Toolkit which is an amazing rooting tool specially for nexus devices developed by WugFresh. Though you can install drivers from the tool itself but if any problem occurs , download drivers from here. Rest of the requirements , nexus tool will do for you so now continue our rooting guide. 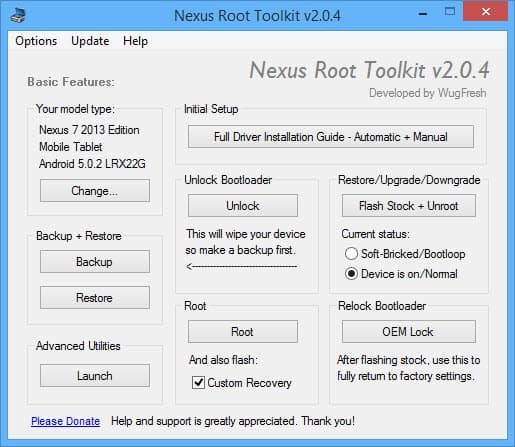 First of all Download and install the Nexus Root toolkit from the above given download link. Now connect your nexus 6 device with your computer. Now launch Nexus toolkit which is installed in your computer. When you will run that, it will ask for device and build number. If you don’t know , you can simple select Auto-Detect. Next, install full drivers if you haven’t installed manually using our another guide. Now unlock the bootloader by clicking on Unlock Button. You successfully unlocked bootloader in your nexus 6 device. Now its time for rooting your nexus 6 device and extending its potentials. Below Root button , you will find option for custom recovery. Make sure its selected only , else check that option and click on Root button to start rooting process. Finally you rooted your Motorola Nexus 6 Smartphone . There are many after rooting tricks coming on TheDroidway . Stay tuned .